Easily fills the scrapper with items and start scrapping with one click. Ignore-List for items you do not want to be added to the scrapper. Keeps track of the items you scrap and the materials you get. Displays scrapping statistics for items you have scrapped. You can type "/scrapmaster", "/scrapmasterhelp" or "/smhelp" for a full list of available commands in game. All of these slash-commands work with either "sm" or "scrapmaster" prefix. /click ScrapMasterButton - You'll want to create a macro for this. It will fill the scrapper with any scrappable items in your inventory that are not on your Ignore-List. 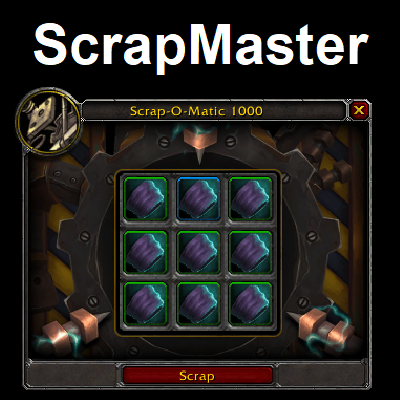 If there are items in the scrapper already, "/click ScrapMasterButton" will scrap them. /smadd [itemlink] - If you have items that you do not want to scrap, add them to your Ignore-List using this command. /smremove [itemlink] - This command removes an item from the Ignore-List. /smlist - This prints the list of ignored items. /smreset - This resets your Ignore-List, removing all items from it. /smclear [itemlink] - This will delete all Scrapping-Data for the item you linked. /smclearall - This deletes all your Scrapping-Data for all items. 2) Auto-ignore Azerite Gear = to your highest Azerite Gear in that specific slot. 3) Auto-ignore gear saved to the Equipment Manager.